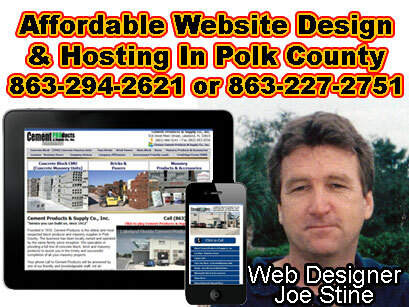 If you need a new or updated website for your local Polk County business, call 863-294-2621 or 863-227-2751 "FOR A FREE PRICE QUOTE" and Joe Stine will make it easy, fast and affordable for you. Joe Stine is a real, local "programmer" educated at both the Winter Haven and Lakeland campuses of Polk State College, and specializes in building dynamic, functional and affordable business web sites that are search engine friendly and boost local company sales. Providing website design and hosting services for some of Winter Haven and Lakeland's most prestigious businesses since 1996, Joe Stine is arguably one of Polk County's preeminent "internet programmers." If SSL security is an issue for you and your website, Joe Stine can install a "Secure SSL Certificate" on your website for only $49 per year. Also, for the do-it-yourselfer, our easy to use wysiwyg web page editor makes it so you can update your own web page without knowing any html programming. Joe also specializes in providing video marketing & social media solutions. Having a "desktop version" and a "mobile version" of your website used to be enough to make Google happy, but not anymore. Historically, the desktop version was indexed, but increasingly, Google will be using the mobile version of the page for indexing and ranking, to better help their "primarily mobile" users find what they're looking for. Make no mistake, Google's new "Mobile-First Indexing" update has had a major impact on many local businesses and their search engine results in Google. Companies that have spent fortunes on SEO are seeing that investment flushed away as they are subsequently penalized for not being mobile-responsive. Ask Joe about getting a "mobile-responsive" website for your business. If you need a new or updated "mobile-responsive" website for your local Polk County business, call 863-294-2621 or 863-227-2751 for a free price quote and Joe Stine will make it easy, fast and affordable for you. Do you need an affordable website for your business? Call Joe Stine, "Polk County's preeminent internet programmer" today at 863-294-2621 or 863-227-2751 for a free price quote! Your business is one-of-a-kind and your business website should also be unique. If you are in a hurry, all you have to do is call Joe Stine at 863-294-2621, and he'll get started on your business' custom website immediately. It's seriously that easy. © 2019 Joe Stine. All rights reserved.